What is Islam ~ Islam My Ultimate Decision . Allah, the Arabic of God, sent his first of the believers Prophet Adam and Eve to this world of ours to lay down the foundation of a community which would take His name in everything they did and lived a life of righteousness, peace and love for each other. After Adam, Allah sent a chain of prophets and messengers including Noah, Abraham, Ishmael, Isaac, Jacob, Joseph, Job, Moses, Aaron, David, Solomon, Elias, Jonah, John the Baptist, and Jesus, peace be upon them all. And also revealed onto a few His holy scriptures as guidelines for others to live a life that Allah has envisioned for us. Like all prophets, the last of the prophets has been Prophet Muhammad (peace be upon him) who came after Jesus in the barren sandy lands of Arabia. Allah also revealed unto Him the last of His scriptures The Holy Qur'an to serve as the last Godly guidelines not only for those who accepted the religion of Islam, but also for the entire mankind till the Day of Judgment. Islam in fact is in continuation of the all previous religions and completes Allah's countless guidelines with the revelation of Holy Qur'an. Those who embrace Islam believe in the absolute Oneness of Allah, in all of his angels and all prophets and the holy scriptures of Psalms, Torah and Bible, and of course the Day of Judgment. This also dispels the notion that many Jews hold that Islam is idolatry as they worship Muhammad. 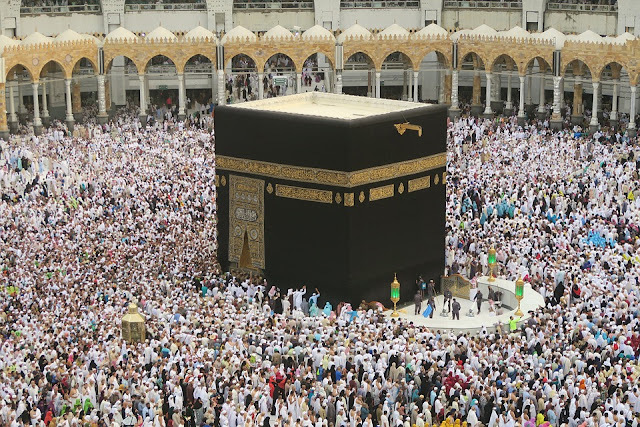 In fact it was Prophet Muhammad (peace be upon him) upon capture of Makkah broke all 360 or more idols of varying natures kept inside the Ka'aba and around and forbade idol worshiping as commanded by Allah in the Holy Qur'an. Thus today, by the countless blessings of Allah, more than a billion people live the life as prescribed to them by Allah in the form of guidelines in the last of the Holy Qur'an and as described by personal living examples by the Prophet Muhammad (peace be upon him). Anyone who embraces Islam, does not only accepts a new religion but a complete way of life as Islam is areligion and "Deen" as well. "Deen" in Arabic means a complete way of life as unlike other religions which were just prelude to Islam, Muslims are given to guidelines how they should live their lives and laws of inheritance, marriage, interest, relatiosn with others and laws to govern their lives. It may be added here that Islam is the continuation of all previous relgions and faiths and as a Muslim, we all submit to the validity of all religions that Prophet Abraham laid the foundation of and all his descendants carried the same torch. While Prophets Moses and Jesus (may peace be upon them) descended from Abraham's younger son Isaac, Prophet Muhammad (peace be upon him) de4scended from Prophet Abraham's elder son Ishmael. It was Prophet Abraham established the settlement in the heart of the Arabia, today known as Makkah, and built a house for Allah called Ka'aba. And since rise of Islam, Muslims from all over the world turn to the direction of Ka'aba to offer their five daily obligatory prayers in unisome to all. The word of Islam was brought to Prophet Muhammad (peace be upon him), a man of 40 years from one of the most respected tribes of Makkah, Banu Hashim. Before the first verse of Holy Qur'an was revealed onto Prophet Muhammad (peace be upon him), he had already a well respected man due to his honesty and integrity. Angel Gabriel had been a bridge between the Allah Almighty and the prophet in bringing down to him the Godly commandments which continued for the next 23 years till the present day Qur'an was finally completed. Why Islam has spread so widel while the already established religions of Jews and Christians were already at their peak in Europe and elsewhere? The answer is very simple: Islam is very simple to understand and very easy to follow provided one has full faith in what he believes. Islam also answers many questions abour life, physics, astronomy, geograpghy and history besides acknowledging all other faiths and prophets before it. In nutshell Islam is all about our way of life, which is not restricted to Muslims but to the entire mankind. Many forms of governments today take references from the Holy Qur'an in establishing welfare states. The commandments of Allah contained in the Qur'an are augumented by the way Prophet Muhammad (peace be upon him) lived his life, called Sunnah in arabic. In fact his whole life was the translation of the Qur'an and whatever he did, practiced and said was all within the fold of Islam as desired by Allah. The five pillars of Islam are: 1) Faith, 2)Prayers, 3)Zakat (Charity), 4)Fasting and 5)Hajj, the annual pilgrimage to Makkah and taking rounds of Ka'aba as was done by Prophet Abraham some four thousand years ago. Please read various sections of our blog for detailed account of each pillar of Islam, about Qur'an and summary of its chapters, about Prophet Muhammad (peace be upon him) and rise of Islam and many other aspects that you may need answers for.